Presidential candidate Bernie Sanders did not just discover Chicago for the 2016 primary in Illinois. An alumnus of the University of Chicago, Sanders was arrested protesting against Chicago's still massive segregation during the 1960s and came to Chicago in 2015 in support of Sue Sadlowski Garza in her campaign for Alderman of the 10th Ward. 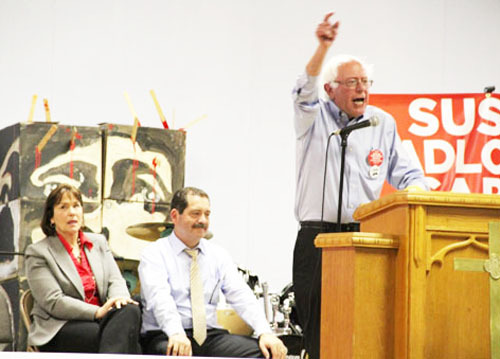 Above, Sanders (right) is seen speaking at a Garza campaign event in April 2015, while Garza (left) and Chuy Garcia (center) look on). Despite claims that polls are showing Hillary Clinton holding what is being characterized as a "commanding lead" in Illinois, Bernie Sanders's support continues to grow as election day nears. Even as northwest side supporters of Senator Bernie Sanders gathered at a "Berniepalooza" in the 45th Ward, support for the Sanders candidacy was growing across Illinois, just as it burst forth in Michigan earlier. With the Illinois primary scheduled for March 15, 2016, more and more people were noting that there were seven ways on the Democratic Party primary ballot to vote for Bernie. Support for the Sanders candidacy stretches from the city's Southeast Side, in the 10th Ward, all the way to the far Northwest Side, the 45th Ward. Although Substance reported in February that that CORE meeting on February 22 had voted to endorse the Sanders candidacy, some CORE members had tried to stall the meeting to prevent the caucus from endorsing Sanders, then continuing to "filibuster" (as one CORE leader put it) to prevent the meeting from continuing long enough to vote to demand a House of Delegates meeting before the March 15 primary. As it was the CORE endorsement won by a majority vote, but the meeting was adjourned before a motion could be made to ask the union for a special meeting. So the CTU House of Delegates will be meeting the week after the primary, rather than in time for the union to vote to back Bernie. After a heated debate, the Caucus Of Rank-and-file Educators (CORE) of the Chicago Teachers Union voted at its February 22, 2016 regular meeting to endorse the candidacy of Bernie Sanders over Hillary Clinton in the March 15, 2015 Democratic Party primary in Illinois. The vote was overwhelming in support of Sanders (this reporter is a member of CORE and was present and voting at the meeting). [img=9022]The endorsement came at the end of a lengthy meeting which also considered issues ranging from the ongoing contract negotiations to the threat by Chicago Public Schools Chief Executive Officer Forrest Claypool to institute a seven percent pay cut against CTU members in late March by rescinding the so-called "pension pickup." The endorsement vote came in part in response to the fact that for more than six months, the Chicago Teachers Union (and hence all CORE members) had been forced to support the Clinton candidacy. The Executive Council of the American Federation of Teachers (AFT) had endorsed the Clinton candidacy after a controversial "push poll," which AFT President Randi Weingarten tried to characterize as a "survey" of the union's members, hence justifying the early Clinton endorsement. Because millions of dollars from the CTU budget goes annually to the AFT, CTU members had in fact been providing support -- in dollars and in other ways -- to the Clinton candidacy for more than six months. Despite attempts by some speakers during the debate to end the meeting early, the debate continued until a final vote was taken. What was not taken was a vote, that had earlier been discussed by not decided, to call for a special meeting of the union's 800-member House of Delegates prior to the March 15 Illinois voting. [img=9024]The February 22 meeting included more than 80 people, making it one of the largest meetings in CORE history. Although the debate was heated, the vote was clear, with a significant majority of the CORE members voting for the Bernie Sanders endorsement. The big news from the February 22 CORE meeting -- that CORE has endorsed Bernie Sanders, in opposition to the AFT's endorsement of the former Wal Mart director, Hillary Clinton, needs to be repeated widely. There were some attempts by people at the CORE meeting to stall the vote on Bernie (or adjourn the meeting early). Nevertheless, the debate was thorough, and Bernie won cleanly. One of those trying to deny the Bernie endorsement claimed was that Bernie had not been active in Chicago on "our issues." In fact, the opposite was true. As the photo at the top of this article shows, Bernie Sanders was the national candidate who came to Chicago and supported "our issues." Hillary Clinton, the former Wal Mart director, was at the time avoiding Chicago, apparently counting on the manipulation of the tiny AFT leadership clique to bring her money and "support." The AFT endorsement of Clinton enabled Randi Weingarten and a faction in the AFT leadership to devote AFT resources, including money and people, to Hillary Clinton's campaign. As the struggle for the Democratic Party nomination became more and more intense, Hillary Clinton's record in support of racist attacks on working people (the three "reforms" promoted during the Clinton administration -- welfare reform, housing reform, and school reform) and actual support for some of the most odious union busting entities on Earth -- Wal Mart. The AFT leadership has never been challenged to explain how with these records, anyone supposedly representing the working class can still back the Clinton candidacy. There are two kinds of power in politics: organized people and organized money. Thanks to more than 5 million individual contributions, we�re raising the kind of money needed to take on the billionaire class. But this weekend � before Illinois votes on Tuesday, March 15th � we need to really focus on organizing people. We�re running the largest grassroots campaign in the history of presidential politics, and if every person who has signed up to support Bernie takes just a few hours over the weekend to tell uncommitted voters about why they�re part of this political revolution, we�re going to win in Illinois on Tuesday. This is such an important stretch for our campaign. If we can win in Illinois and do well in other states, we�ll be well on our way towards winning this primary, the White House, and taking back our country from the billionaire class. Tens of thousands of supporters are already set to take action this weekend. Bernie needs you to join them. Bernie Sanders upset Hillary Clinton in the Michigan presidential primary on Tuesday, securing a larger share of voters of color than he has ever before and significantly winning young voters, who came out in record numbers. Though the polls predicted she would easily win Michigan, Clinton secured just 65 percent of Michigan�s African American vote. That number is significantly lower than her usual results � including Mississippi, which also held a primary on Tuesday, and where she secured almost nine in ten black voters. The only state where Sanders won a larger share of African American voters was his home state of Vermont, which is only 1.2 percent black. Michigan, meanwhile, is more than 14 percent black. Frederick Malone, who was wearing and selling t-shirts reading �Black Men for Bernie� at a press event in Flint on Monday, told ThinkProgress that the more black voters hear about Sanders� policies, the more they support him. �Bernie�s been for the black people for a long time,� he said. When asked why Clinton has been winning Southern states with large black populations, Malone faulted it on Sanders� speaking skills. Frederick Malone sold T-shirts at a press event in Flint. Sanders also performed well with other people of color and young voters. He made an intense last minute push to campaign on or near college campuses and it paid off � 21 percent of voters were under the age of 30, and Sanders won 81 percent of young voters. One of those events was held the day before the primary in Dearborn, a city to the west of Detroit with the highest concentrations of Arab Americans and Muslim Americans in the United States. The line for the rally wrapped around the building, and hundreds of young Muslims � students and recent graduates � filled the theater�s seats. Sanders won Dearborn with 67 percent of the vote, compared to Clinton�s 33 percent. This is my first political rally ever. Hachem and her friends, all Muslims born and raised in Dearborn, also called out Islamophobia from candidates like Donald Trump and said that Sanders has made them feel comfortable as young Muslims in America. At that rally, Sanders was well aware of the strategy it would take for him to pull of a Michigan victory. �We will win if there is a large voter turnout,� he said during his speech, to huge applause. �Please make that happen." Sanders says, "I stand with Chicago teachers..."
As the Chicago's Teacher's Union announced plans Wednesday for a one-day strike on April 1, Democratic presidential hopeful Bernie Sanders took to Twitter to pledge his support for the group. "I stand with Chicago teachers," Sanders tweeted. "We shouldn't close schools and lay off teachers to reward Wall Street." A flyer on the union's website urged Chicagoans to "join families, teachers, workers and all those who thirst for justice" in an effort to "shut it down" on April 1. The flyer features photos of Gov. Bruce Rauner, Mayor Rahm Emanuel and billionaire Ken Griffin and touches on four main points: corporate welfare, tax injustice, growing poverty and racial justice. Sanders is in a highly-contested race with former Secretary of State Hillary Clinton for the Democratic presidential nomination. He will host a rally Friday at Argo Community High School in suburban Summit. Clinton currently leads Sanders in pledged delegates, 760 to 546. Clinton took Mississippi Tuesday, with Sanders taking Michigan. According to a recent Capitol Fax/We Ask America poll, Clinton holds a commanding lead over Sanders among Illinois voters. The poll, which surveyed 994 likely voters and was taken Monday, shows Clinton receiving 63 percent of support and Sanders receiving 25 percent. The candidates will face off in Illinois� March 15 Democratic presidential primary.